Coded blue, because they are fast and easy to write. 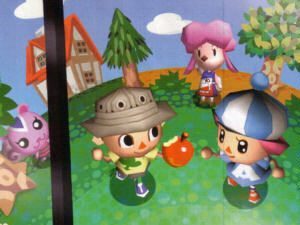 Pic of the day: Semi-official graphics from Animal Crossing. While Sony with their PSP have taken the view that "since we are inherently superior, we'll just curl up on these imaginary laurels and sleep until the world discovers our greatness" (much the same attitude that I tend to display in my own life, I sometimes think)... while they do that, their junior competitor is busy doing the things Sony should have done from the start. The Nintendo DS came off to a running start because it ran pretty much any Gameboy Advance game right out of the box. Then more titles were augmented for dual screen and stylus operation. Then the native DS games came with improved graphics and more complex content, like the "Nintendogs" which drew in lots of grown-ups who had not considered buying a game before. The way they saw it, they did not buy a game but a non-shedding pet. But now Nintendo has rolled out the very thing that you'd expect from Sony: Internet connectivity. Both of the handhelds come with built-in wireless capability. The PSP can already connect to the Internet, as shown by its web browser. But it is Nintendo which allows players of their most recent games to hook up via Internet instead of locally, surely a boon to those who don't live in cities. So far Mario Kart has got an online following, but the great attractor is slated for December: Animal Crossing: Wild World! For those who don't know about Animal Crossing (and this included me until just recently), it is a small town populated by ugly talking animals. Each of them has its own life, its own goals and attitudes, and its own place to live. Your avatar moves in among these, in a tiny house of its own. By befriending these animals, you find out what makes each of them tick, and can trade with them. As in, you find some object in nature and give to one of them and they pay you or give you something in return. Or you do a service for one of them and get something. However, you cannot do this in fits and starts, there are only a few opportunities each day, so slowly does it. The "a little each day" approach reminds me of Nintendogs, the town full of cartoonish people and the picking up stuff from the terrain reminds me of Friends of Mineral Town, and people who know the game says that Sims 2 for Nintendo DS is also partly inspired by Animal Crossing, which may in turn be somewhat inspired by The Sims. Given that these (and the ill-fated Urbz, about a single Sim) are the games I have already bought for this machine, it certainly sounds like something for me. But that is not a big deal. I am just one person. The big deal is the WiFi. If you live near a WiFi (wireless network) spot, either you have it in your home or go to McDonalds or camp outside a hotel... you can hook up with people from all over the world. They can visit you and you can visit them, and exchange stuff and ideas. Some of your furry townies may even decide to move over to their town instead, or the other way around! Your furry (or feathered) friends carry with them fragmented memories of you: Random things you have said and done, perhaps clothes or furniture you have designed. I am not sure whether it is compatible with my home WiFi, I suppose I can find out soon enough. But it seems quite likely that hundreds of thousands of people will make use of this feature, since games like this typically sell a few million. Another small step toward world peace. Three years ago: Pickled cucumber?? Five years ago: "Overindulgence day"